A 1960 Ferrari for $6.38 million? When will this stock market finally hit the “top,” bounce off, and fall back to earth, according to the principles of gravity, which it has been defying for years? That’s the question everyone has. To defend the current valuations, Wall Street drags out ever crazier metrics of future expected pro-forma adjusted good-items-only earnings per share. Financial engineering is hot; corporations are borrowing at ludicrously low costs and are buying back their own shares with the proceeds, piling up debt on their balance sheets and hollowing out equity. It makes those metrics look even better. And numerous stocks have valuations that boggle the rational mind even at those ever crazier metrics. But the ride has been great so far, and everyone who went along made a ton of easy money – unless you got stuck in energy. Everyone knows that it was a result of the Fed’s free-money policies that have been duplicated around the world. QE ended in the US, and the markets didn’t swoon because by then, the Bank of Japan had cranked up its own QE monster, and the ECB was spreading the word that it too would launch its own QE monster, which it now has. US stocks have digested the end of the Fed’s QE, but they’ve stopped soaring. They’re limping along, sometimes higher, sometimes lower, and volatility has returned. Next step for the Fed will be the momentous decision to raise interest rates by one tiny fraction, from essentially zero to just barely above zero. Wall Street soothsayers are crying out loud that the Fed would never be able or willing to do that because it would blow down the carefully erected construct of wealth created out of thin air. In order to get out of the market in time and avoid getting caught in the downdraft, when it comes, everyone is keeping an eye out for signs of that top, the point on the chart years later that marks it as the top, the point where you should have gotten out, though no one can see it until long afterwards. So here is another sign of the top, observed by Brett Eversole – a sign decorated with lots of dollars, fearless American investors, white-hot classic cars, and breath-taking prices. Enjoy! I spent most of the weekend at the Ritz Carlton in Amelia Island, Florida – where a 1960 Ferrari sold for a cool $6.38 million on Saturday. Classic Ferraris are up 254% over the last five years… but it wasn’t just Ferraris that people were buying. Heck, a 1973 Porsche 911 sold for $891,000 – and to you and me it just looks like, well, a Porsche 911 from the 1970s. This was the scene Sunday morning, less than 30 minutes after the show opened. Folks poured in. And the crowds didn’t let up until late in the day. I’ve been going to this show for years. This year was the busiest – by far. 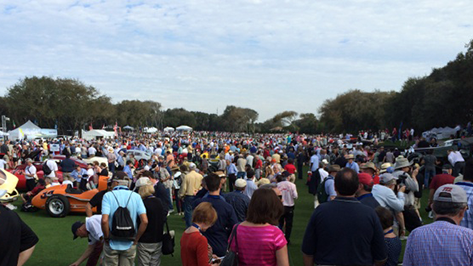 Last weekend’s event in Amelia Island showed me that American investors are no longer fearful. The prices and the turnout made me think that we are in the later innings of this stock market boom, where investors are becoming more willing to speculate. The car market wasn’t always this hot… The entire classic car market fell by double-digits during the financial crisis, based on the Historic Automobile Group International (HAGI) Index. But this weekend shows that times have changed. The wealthiest in America are flush with cash. They’ve made good money in stocks so far. And they’re using their gains and their optimism to boost prices in classic cars (among other assets). The U.S. stock market celebrated six years of this bull market earlier this month. The fun doesn’t have to end tomorrow. But this weekend showed me that we are no longer early in the boom. They are most probably not your traditional investor. These folks are driven by fair, looking for hard assets that are movable and not liable for tax. As the state becomes more aggressive towards their citizens for tax because most western governments are broke. In London at the moment they can’t get enough stock of classic cars, antique jewellery and art. Let’s face it when the bond bubble bursts all hell is going to break lose. The process has started here in Europe with the failure of the Austrian Bank and the state has reneged to make good on the bonds. Spain had a bank go into bankruptcy this week and will use the new bail in procedure and bond holders will not be honoured. Italy has just discovered 185 billion of debt in didnt know about and then there is Greece. So can some one please explain what was so wrong with a top tax rate of 90%??? Aside from the fact that it was ineffective, immoral and did nothing to address the issues with unsound money and out-of-control spending on wars and welfare, it was awesome. What was immoral about it exactly? Gosh, I don’t know. Have you ever heard of property rights? Or do you want to give an institution run by sociopaths the authority to use violence, coercion and force to steal from you? And why do they have the right to determine how much you can own? Again, this doesn’t get to the main issues facing us today, which are corporate personhood and the Federal Reserve’s central banking monopoly. Two of my billionaire clients both are owners of the thirty plus million dollar 250GTOs are waiting. Quote; what goes up eventually comes back down and then I’ll buy. Sounds like the classic car market is much healthier than the bond market at the moment. I suspect it will hold up much better over the next few years as well. If the ’50s era cars still in use in Cuba are any indication I’d sa that’s a valid assumption.